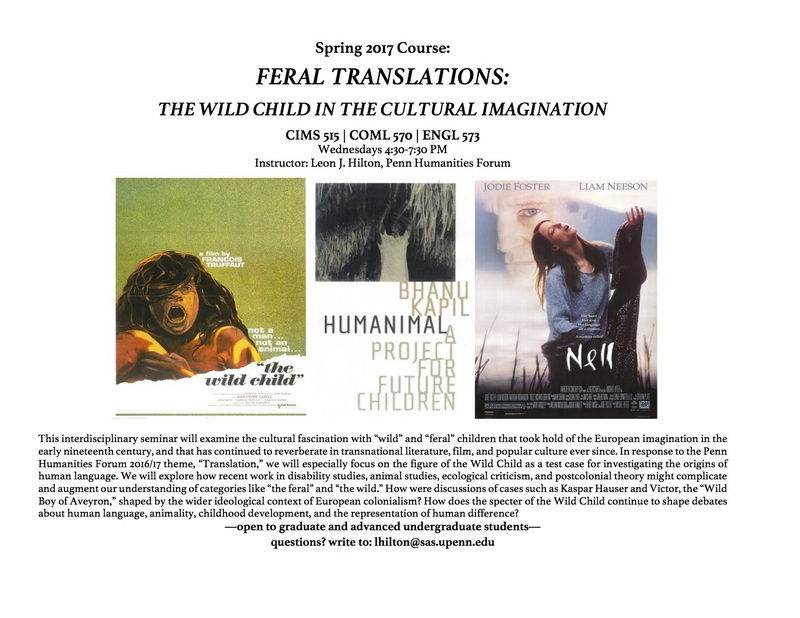 This interdisciplinary seminar will examine the cultural fascination with “wild” and “feral” children that first took hold of the European imagination in the early nineteenth century, and that has continued to reverberate in transnational literature, film, and popular culture ever since. In response to the Penn Humanities Forum 2016/17 theme, “Translation,” we will especially focus on the figure of the Wild Child as a test case for investigating the origins of human language. We will consider how attempts to educate and “civilize” so-called feral children can be understood as particularly fraught “translational” projects, reflecting broader historical, philosophical, and scientific contestations over the boundaries of the human and the limits of communication. We will also explore how recent work in disability studies, animal studies, ecological criticism, and postcolonial theory might complicate and augment our understanding of categories like “the feral” and “the wild.” For instance, how were discussions of cases such as Kaspar Hauser and Victor, the “Wild Boy of Aveyron,” shaped by the wider ideological context of European colonialism? How did the concept of the feral child play into emerging scientific discourses about racial difference that emerged in tandem with imperial ventures across the globe? Finally, we will ask how the specter of the Wild Child continues to shape debates about human language, childhood development, and the representation of disability and human difference. Primary texts will include the nineteenth century physician J.M. Itard’s diaries recording his work with Victor of Aveyron and contemporaneous writings about wild children by Rousseau, Wordsworth, and Kipling; films such as François Truffaut’s L’enfant sauvage (The Wild Child) (1969) and Werner Herzog’s Kaspar Hauser (1974); and more recent contributions to the Wild Child genre, such as Kathy Acker’s Blood and Guts in High School, T. C. Boyle’s Wild Child and Other Stories, Bhanu Kapil’s Humanimal, and the 2015 documentary The Wolfpack. We will also draw on critical writing by Giorgio Agamben, James Berger, Mel Y. Chen, Jacques Derrida, Michel Foucault, Donna Haraway, Julia Kristeva, David Michell and Sharon Snyder, and Cary Wolfe, among others.